The simple hasten eagerly to see the newborn king lying in a manger … they adore and rejoice and mingle their artless praises with the heavenly hymns. … How the Virgin rejoiced at the devotion of these simple folk! How delighted and gladdened she was by their praises! For by his own announcement God had begun to make known to human beings the mystery of divine condescension which had occurred in her womb for their salvation. Throughout the Christian era, rich traditions have arisen surrounding the nativity of Jesus, and these traditions have given a prominent role to Mary. As the mother of the Christ, the “Word made flesh,” Mary plays a special role in God’s plan of salvation. Although Christians differ on the nature of her role, Mary has been honored throughout history for being the handmaiden of the Incarnation. Matthew and Luke give few details about Jesus’ actual birth. According to the Gospel accounts of Matthew and Luke, Mary was a young Jewish woman, possibly still a teenager, betrothed to a man named Joseph. Although the Gospels say nothing about his age, the church has traditionally viewed Joseph as much older than Mary, in part because of his apparent death before the start of Jesus’ ministry. Whatever their ages, we do know that the couple traveled to Bethlehem, Joseph’s ancestral hometown, for a census. Upon their arrival, it became clear that Mary would soon give birth, and yet they could not find a place to stay. The “inn” of most English translations need not be a hotel—it could refer to a relative's home, for instance. It is likely that Jesus was born not in a wooden barn but in a cave or a shelter built into a hillside. The hills around Bethlehem were dotted with small caves for feeding and boarding livestock. Joseph probably had to lead the donkey bearing Mary down a rocky, jagged path into the mouth of one of these caves as she was experiencing labor contractions. The Gospel writers do not mention if anyone else was present, but self-delivery was not uncommon in first-century Palestine. The exact site of Jesus' birth is unknown, but by the third century, tradition had established a probable cavern. Constantine’s mother, Helena, erected the Church of the Nativity in Bethlehem over the small space. Nearby is the Milk Grotto, a small cave with chalky white rocks, where it is believed Mary nursed the baby Jesus as they fled from Herod's soldiers. The story goes that she spilled a few drops of milk that whitened the rocks. To this day, Christian and Muslim women visit the Milk Grotto and ask Mary to help them conceive and nurse. Early Christians were quick to identify the nativity scene as a reversal of Isaiah 1:3. The prophet announced that “the ox knows its owner, and the donkey its master’s crib; but Israel does not know, my people do not understand.” Origen and Augustine, among others, affirmed that in the guise of the shepherds and the wise men, humanity had literally returned to its master’s crib. Although the story of the nativity makes clear that Mary is the physical mother of Jesus, the nature of her motherhood was hotly disputed in the Christological controversies of the fourth and fifth centuries. Was she in fact the Mother of the second person of the Holy Trinity, or was she simply the mother of Christ's human nature? Nestorius’ position was rejected at the Council of Ephesus in 431, which decreed that Mary was in fact the one who gave birth to the second person of the Trinity in history. The bishops claimed it is fitting and proper to call her the Theotokos, not because she was the “origin” of God, but because the baby she delivered in Bethlehem possessed a human nature mysteriously joined to the eternal nature of God. To reject the term “Mother of God,” they argued, is to deny the full divinity of Jesus. Catholic and Orthodox believers continue to celebrate this understanding of the nativity on the first of January with a feast honoring the Theotokos. Once Mary’s status as Mother of God was firmly established within the church, devotion to her and contemplation of her earthly life increased among pious Christians. Mystical visions and art celebrating the nativity spread, elaborating on the biblical story. Bridget of Sweden (1303-1373) experienced mystical visions of the nativity which she recorded in her Revelations, and which fueled popular representation of the nativity from the fourteenth century through the Renaissance. Bridget described Mary’s labor as painless: since Mary had been cleansed of original sin in the Immaculate Conception, she did not suffer from Eve’s curse. Rather, “In an instant, she brought forth her Son, from whom there emanated such an inexpressible radiance that the sun could not be compared with it.” Renaissance paintings of the nativity, which show Mary and her child shining in the center of the canvas, owe much of their visual appeal to Bridget’s revelations. St. Francis of Assisi had his own mystical experience of the nativity when he celebrated Christmas mass in a small cave in Greccio, Italy, using a crib for an altar. As he preached over a carved image of the baby Jesus, Francis experienced a vision of the Christ child in the flesh and was awed by the mystery of what Mary experienced at the moment of the Incarnation. Because of her obedience, the world received the presence of God encased in the helpless flesh of a baby. 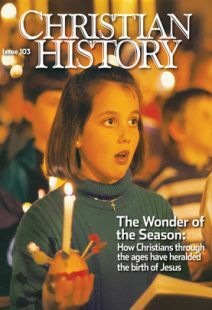 As the story spread, so did the tradition of placing cribs in Christian homes at Christmastime. In Protestant churches after the Reformation, Mary played a less central role in celebrations of the nativity, despite the fact that Luther and Calvin maintained a high view of her place in salvation history. Emphasis was increasingly placed on the Christ child alone, rather than on his mother who birthed God into the world. Nevertheless, all Christians appreciate the important role Mary played in the life of Jesus. Though he was fully God, Jesus was born from Mary and it was from Mary that he received his humanity. She experienced intimately, in her own body, the mystery of the Incarnation. In a dank cavern, recovering from labor among the straw and squalor of the animals, the “highly favored” Mary became the first human creature to touch the face of God. Sarah E. Dahl is a freelance writer living in Minneapolis, Minnesota.